One way for me to prepare a fast dinner is to dump all ingredients in the slow cooker in the morning before I go to work. It works pretty good for me as a full time working mum as I have got little time to prepare dinner during week days. Yesterday morning, I boiled this pot of Kampung Chicken soup on the stove top till it is boiled then transferred the whole pot of soup into the slow cooker, set to low heat, let it cook by itself till I come back from work, usually more than 8 hours. Just add salt to taste and serve. 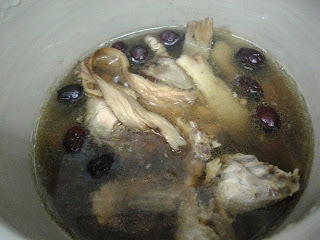 Slow cooker is very useful for cooking that requires long hours of boiling like kampung chicken soup such as this one. It is also ideal for stewing beef too. 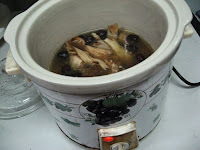 We are always in a rush in the morning during school days, so I always cook soup for the dinner in the slow cooking.